The Egyptian Bug small wall decor made from fibre glass makes a fabulous addition for any wall or Egyptian scene. The Egyptian Bug small wall decor is easy to hang on the wall or ceiling. This bug is also known as a sacred scarab which was found on pyramids, temples and have been found placed on the chest of the deceased. The bug was a huge part of ancient Egyptian funerary art. 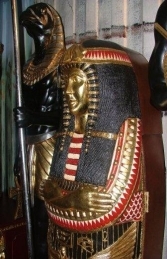 This would like great with one of the many other Egyptian models or wall decor.